Please note: This calendar is for personal and classroom use only. You do not have permission to take this calendar and sell it or share with others. If you want to make your own handprint calendar have fun with it, but if you choose to share or sell it, it needs to be your own creation and you need to obtain your own clipart. Familiarize yourself with copyright laws, and be sure to ask permission if you aren’t sure about something. The Little Giraffes Handprint Calendar has been offered here at Little Giraffes since the site was started back in 2002. Many teachers have used it and it makes a great parent gift for Christmas! 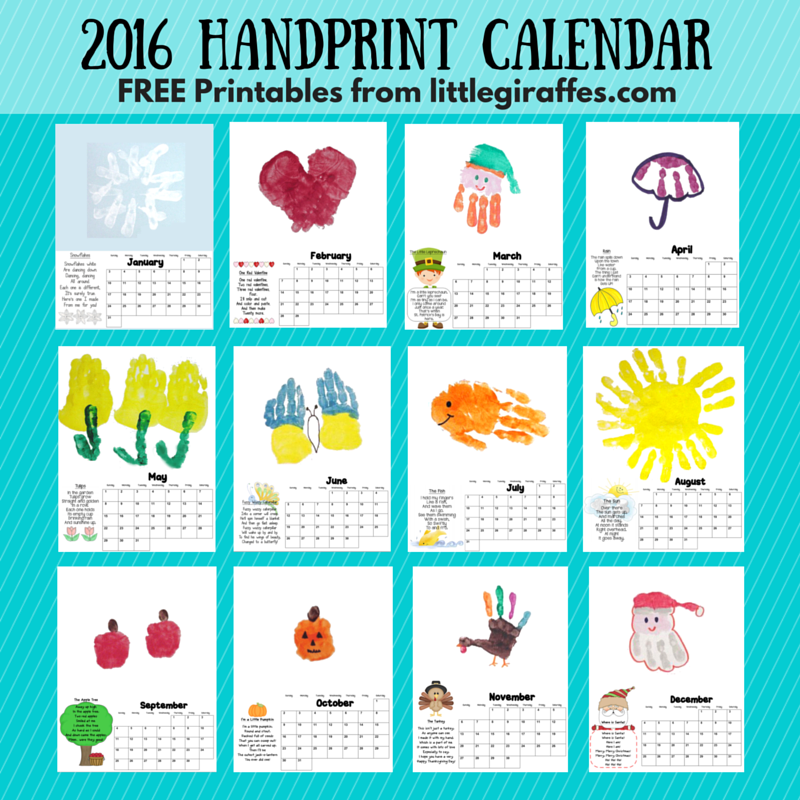 Mrs. Flanagan, the founder of Little Giraffes, adapted the handprint calendar idea from one at http://www.abc123kindergarten.com. There is an addition to this calendar, a touching poem that was written and shared by Amy Ethridge of Meridian, MS. She suggests using this as a second page or you could attach it to the envelope you use to send the poem home. Her poem and a photo are right below the cover page. I used 8 1/2″ X 11″ index paper for each calendar page and the cover. The original photos show mini borders for the poems and small calendars are from the Print Shop program. The updated printable version with new clipart was created by A to Z Teacher Stuff. The children’s hands were painted with tempera paint and stamped on the top half of each page. The poems were printed on the left bottom and the calendar was on the right bottom of each page. A punch and bind machine finished the top edge. But these handprints were made to stay. A special “I Love You”, for you from me. When you look at the hand what do you see? There are just some lines most would agree. And notice the treasures that are found within it. From tulips to beautiful butterfly wings. A pumpkin, an umbrella, that’s only a start. The hand can be snowflakes that fall from the sky. The hand can be a leprechaun trying to hide. It can be the sunshine to brighten the day. It can be a fish swimming away. Whatever you make it, you can’t go wrong. Created this for you with body and soul. Keep it and use it till the time has past. Then put it away so the memories will last. Use blue index paper for the background. Paint four fingers of one hand with white paint. Stamp in a circular shape to form the basic snowflake, repainting fingers after each stamp. Then go back and stamp fingers across the first stamps in an X shape as shown on the calendar snowflake. Paint both hands red. Slant each hand and overlap the fingers as they are stamped, forming the heart shape as shown to the right. I’m as tiny as I can be. St. Patrick’s Day is here. Paint fingers orange. Paint base of palm pink with a thin strip of orange above that. Paint thumb and rest of palm green as shown. Use marker to make eyes and mouth. Paint fingers and area just below fingers purple. Stamp upside down to form umbrella shape. Use marker to outline umbrella and to make a handle. Paint fingers and area below fingers yellow, as shown in drawing. Paint one finger green and stamp tulip stem and leaves. Use this method to make two or three tulips. Paint both hands using these directions. Paint the palm of the hand one color and the fingers a different bright color. (Do not paint thumbs!) Stamp left hand on left side of paper. Stamp right hand on the right side of the paper. When dry, use a black marker to draw in the center of the butterfly. Use blue index paper for the background. Paint hand, including thumb, orange. Keep fingers and thumb close together. Stamp horizontally on paper. The thumb will be the lower fish fin. Use marker to make a face on the palm area of the hand. Paint entire hand yellow. Have student spread fingers and thumb apart as they stamp in one direction. Paint again and turn hand in opposite direction with fingers spread. Continue until rays are formed around the entire sun. Paint palm of hand red. Stamp twice to make apples. Use a fingertip dipped in brown paint to make the stems. Paint palm of hand orange. Stamp to make pumpkin. Use a fingertip dipped in brown paint to make the stem. Make a jack-o-lantern face with a black marker. Paint palm and thumb brown. Paint each finger a different color. When dry, dip index finger in red paint to form wattle. Use marker for legs, beak, and eye. Paint fingers white. Paint base of palm pink with a thin strip of white above that. Paint thumb and rest of palm red as shown. Use marker to make eyes and mouth. Draw in facial features with a marker.